Earnings Recap: Did These Dividend Stocks Deliver? Q1 earnings are in – did your portfolio profit or plummet? The last of the first-quarter earnings have hit investors' inboxes, turning shareholders' portfolios topsy-turvy. Let's look at the latest influx to see if your dividend stocks are about to soar -- or sink. 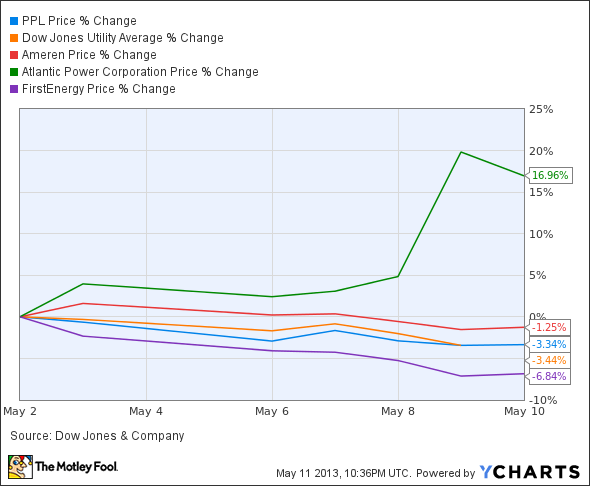 PP&L (NYSE:PPL) reported earnings May 2, missing on sales expectations but managing to squeak past earnings estimates. Top lines have been tumbling across the sector, and PPL's bottom line took a major hit when trimmed hedged wholesale power prices pushed its unregulated earnings down more than 50%. With natural gas' recent price increase, bad hedges proved a common theme for unsuspecting utilities. Exelon (NYSE:EXC) took a one-time $235 million hit, but Exelon's and PPL's nuclear fleets will ultimately benefit from more expensive gas. Ameren also reported earnings May 2, missing on both top- and bottom-line results. But the utility is nearing the finish line of a massive business overhaul, and number crunching takes a back seat to strategy as Ameren exits the competitive business and heads into regulatory waters. With a successful $900 million asset sale to Dynegy (NYSE:DYN) in March, Ameren has three leftover gas-fired energy centers it still needs to offload. Its regulated division recently celebrated wins in its Missouri and Illinois transmission services, which should help to keep this dividend stock's 4.4% yield sustainable for the foreseeable future. Atlantic Power (NYSE:AT) reported earnings on May 8, beating sales estimates and pulling in positive earnings for the first time since Q2 2011. Atlantic's stock had been beaten down around 60% since 2013, after dismal Q4 earnings and a severely slashed dividend left investors less optimistic about Atlantic's future. Since then, Atlantic has closed down non-core assets, improved cash flow, decreased short-term debt, and advanced its renewable-energy portfolio. At its current price, this dividend stock currently offers a 7.2% yield, and investors seem to be willing to give Atlantic another chance. I took a closer look at how its fundamentals, valuation, and business strategy can push its price back up. Its stock is cheap and its business looks better -- but I'm not buying yet. FirstEnergy (NYSE:FE) reported earnings May 7, exceeding top- and bottom-line expectations. Unlike Atlantic, its priced-for-perfection dividend stock gave less punch to positive news, and investors aren't elated with FirstEnergy's 1.6 debt-to-equity ratio. With 64% coal capacity and an additional 18% in nuclear, FirstEnergy is poised for margin expansion as natural gas prices head higher, but it bit the bullet on commodity pricing this past quarter. With a 5.1% yield, FirstEnergy's dividend offerings are tip-top -- but a lack of energy diversity and high debt should keep investors watchful of this utility's next moves. In the past two weeks, every stock except FirstEnergy has exceeded the Dow Jones U.S. Utilities Index. Atlantic stock has soared 17%, while Ameren and PPL are down slightly. Quarterly earnings reports can prove to be major movers for dividend stocks, but the ever-watchful investor will practice constant vigilance with a long-term perspective. Check back weekly for Foolish updates on your dividend stocks, and you'll be well on your way to pulling sustainable profits quarter after quarter.